Democratic Rep. Paul Rosenthal was kicked out of office (via losing in the primary) partially due to his inappropriate behavior with a former campaign staffer and it looks like Rosenthal is looking for a “Get Out of Jail Free” card. Behold the email he sent to the committee about his suggestions for policies about “Workplace Sexual Harassment.” It’s rich. Literally, every single one could apply to him already. Except maybe the third one, which applies to future incidents. Regarding the complaints being immediately returned to the person without the complaint being read, what are you afraid of people reading? What have you done? Why is everything so secretive? Regarding “any complaint made against a former member for an alleged act that occurred after the member has served in the legislature, but the member is no longer in the legislature,” what did you do while you were in the legislature? Are you worried that someone is going to squeal on you? 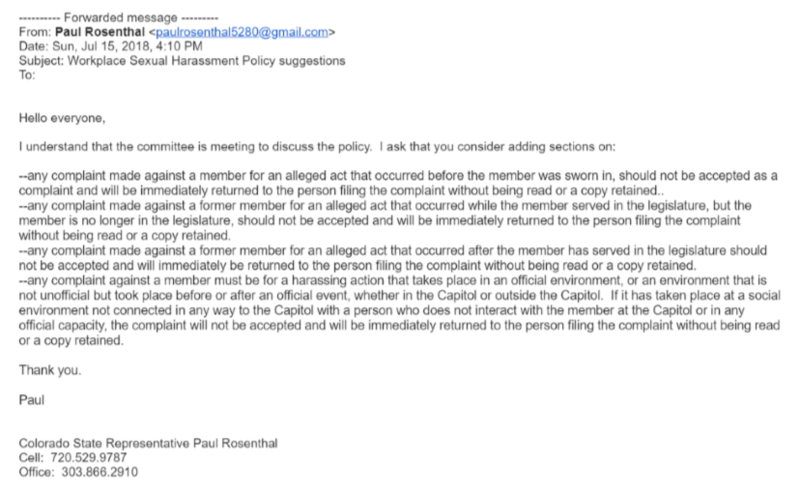 Regarding, “any complaint made against a former member for an alleged act that occurred after the member has served in the legislature should not be accepted,” are you planning to continue to harass after you leave? All in all, not a good look for Rosenthal and invites more questions than it clears up.